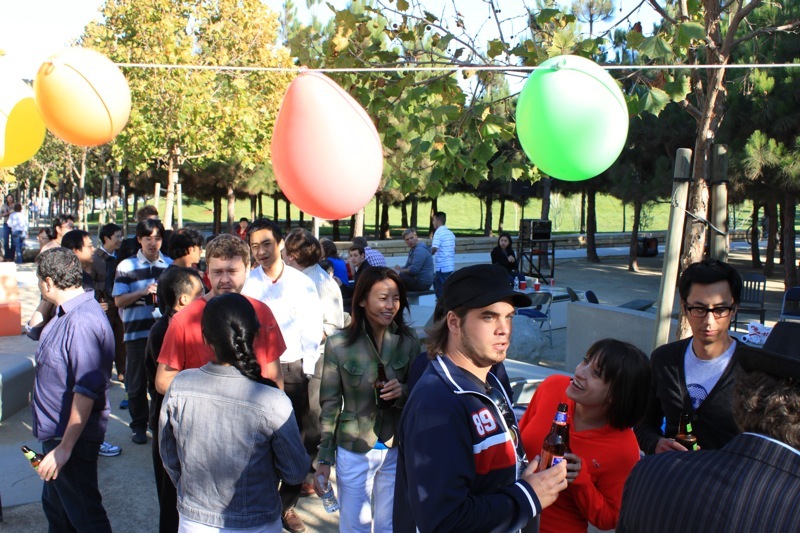 On September 24th 2009 the PSA celebrated the National Postdoc Appreciation Day at the grass field in front of Genentech Hall, which was covered in balloons and sunlight for this special occasion. Not only postdocs, but also hungry PI’s, collegues and friends gathered around the grill and suddenly realized that being a postdoc is not that bad at all. We don’t know where they all came from, but it must be said that it was fantastic to see 400 people having fun and celebrate their postdoc day. It must also be said that it was pretty impressive they were able to drink all the beers and eat 100 kilo of burgers and sausages within two hours. Yes, there was free food, but that is not what made this day so special. Was it the magician, who attempted to trick postdocs and make them laugh about things that are scientifically not possible (a true challenge)? Was it the fresh fruit summer punch made by superman? The picture contest? Little postdoc-children (meaning the children of postdocs, not the postdocs themselves) running around with balloons? The very cool music that matched with the weather? The proud eyes of the volunteers and the sweat on their face (who says postdocs cannot work in a team?)? If you didn’t get the chance to meet new postdocs, probably because you were not able to talk with your mouth full of sausage or veggieburger, please join one of the upcoming postdoc PSA events. Feel welcome! Hope to see you soon!